Suunto – The one and only Golf Watch in the world! Finnish Suunto watches represent the world leading knowhow. These wrist computers can monitor your heart rate, use GPS navigation, have altimeter, barometer, storm alarm, depth meter, compass etc.. The unique Golf Watch, Suunto G6, is an instrument which provides you with accurate and reliable golf swing analysis after every shot! You can also download your swing’s tempo, rhythm, length and speed information to your PC, and analyze it against leading players in the world. The new Suunto G6 enables the golfer to discover the perfect swing. After each swing, they can check their tempo, rhythm, backswing length and speed. This feedback helps identify the best shots, developing muscle memory to repeat only the good shots. After the session, the players can analyze their overall consistency. More than two years of development and research were needed to integrate three acceleration sensors in the lightweight (55g / 1.92 oz.) Suunto G6 watch. As this watch measures 200 times a second the movement of your wrist with extremely high accuracy it is called a wristop computer. 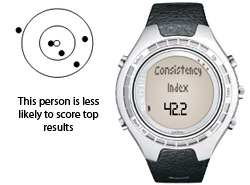 Improvement relies on consistency, that's why Suunto G6 measures the consistency index. It indicates the overall accuracy for systematically repeating similar golf swings. It indicates the muscle memory because accuracy relies on consistency! "Its a great practicing tool for young players to find a perfect swing tempo and improve muscle memory." Tempo (T) is the time from club take-off to ball impact. Pro's tempo is between 0.9 and 1.3 seconds. You might be slower because of age or fitness, but tempo also relies on the rhythm of your swing. Rhythm (R) indicates the duration of the downswing compared to tempo. For example, if the rhythm is 25%, the downswing takes one fourth of the swing. 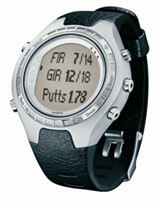 While practicing to reach this tour players ratio Suunto G6 shows the length of the backswing, too. Length (L) of the backswing measured in degrees affects the rhythm and tempo but is easy to control and to improve using the Suunto G6. If these parameters match well your swing will end up in a higher clubhead Speed (S) and you will get a better feeling for the ball impact. Teaching pros can take their classes to the next level! Measuring the student's swing becomes effortless. The laborious indoor video session can now be replaced by this new school teaching tool, Suunto G6. During the Game Suunto G6 simplifies scorekeeping, completely erases the need for paperwork and memorizes information such as scores and handicaps. 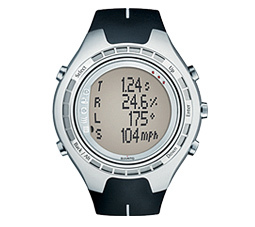 Four different game types ensure that every golfer can enjoy Suunto G6 the fullest. 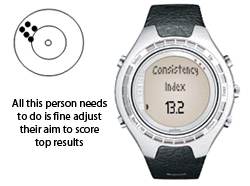 During the round, the Suunto G6 constantly updates the leader and thus allows players with different handicaps to compete seriously. 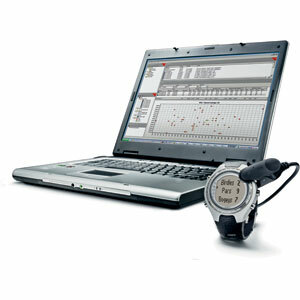 After the round the golfer is able to analyze the game with Suunto Golf Manager PC software to identify the areas that need improvement. The G6 Pro includes this software - if you don't think you'd use this feature, the Standard G6 comes without it. The G6 Pro is equipped with a leather strap rather than the polyurethane strap of the G6.